What's The Difference Between Facebook Ads Average and Maximum Cost Bidding? 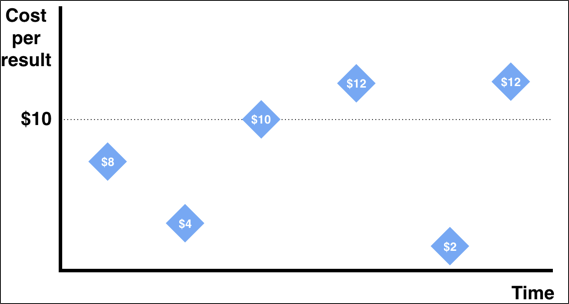 Recently Facebook launched a new bidding model for conversion-optimized advertisers, now allowing advertisers who choose a manual cost per conversion bid to select between an additional two options: maximum and average cost bid. Facebook explains that average cost bidding "allows you to tell us what you want your average cost per result to be, rather than the maximum amount you're willing to pay for any given result. If you use this type of bidding, we'll try to get you as many results as possible while keeping your desired average cost in mind." 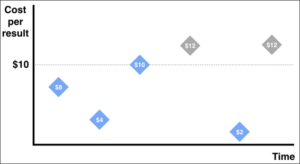 In the case your average CPA bid is $10, you would receive all six of these graphed conversions; your average CPA would be $10. Facebook explains that maximum cost bidding "allows you to tell us the maximum amount you're willing to pay for a result. If you use this type of bidding, we'll try to get you as many results as possible at a price equal to or less than your bid." In the case that your maximum bid is $10, you would only receive four of the six graphed conversions; your average CPA would be $6. In the above example it may be hard to imagine why you would ever want to pay more per conversion by using an average bid ($10) verses a maximum bid ($6). The justification for using an average bid vs maximum bid is if you do not need to enforce a strict maximum amount paid per conversion and have room to play with your profit margins. As is common with CPA optimizer algorithms, by using a maximum CPA bid you end up throttling the number of conversions you may receive by throttling the number of auctions the algorithm allows you to participate in as it seeks to achieve your goal. While using a maximum bid is great for ensuring that you hit a cost per conversion goal, in the example above you would only receive 67% of the potential conversions available given your targeting. Furthermore, in practice this throttled amount of conversions you are precluded from receiving is often times higher than 33%. Advertising is an investment, and oftentimes we digital marketers can become hyper-focused on efficiency metrics such as conversion rate, CPA, ARPU and ROAS. While these metrics are important for comparing and analyzing how efficient we are at marketing and driving results, the ultimate goal of a (for-profit) business is to acquire customers, make revenue and generate profits. While choosing maximum bidding may lead to a better efficiency metric (CPA), it can lead to a worse effectiveness metric (profit). Assume that using a maximum bid will produce 67% of the conversion volume that an average bid will generate. Analyze each conversion or new customer on a lifetime value basis (LTV accounts for factors like new user referrals, number of purchases, value per purchase and churn, which is difficult to measure but is the current ideal metric used to value conversions). Acknowledge that there are some costs involved in fulfilling the conversions such as server, customer service and other costs, represented as COGS. In this example we can see that by using a maximum bid to maintain a lower CPA($5 vs $8) we achieve a better CPA, but having our total conversion volume throttled (67% of potential volume) causes us to sacrifice total profits to the tune of -38.6% or -$13.07 per 10 conversions. Even if we manage to keep the same conversion volume and cut the maximum CPA to $4, we still end up sacrificing profit. 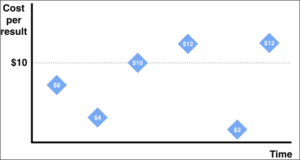 This example simplifies the complexity of an actual business situation, yet nonetheless illustrates both the utility of Facebook's new average cost bidding model AND the need to analyze and make decisions regarding digital marketing performance based on business goals that factor for more than just efficiency metrics like CPA. That's all for now folks! Thanks for reading - stay tuned to the Incipia blog or subscribe to our email list for more information on app store optimization and marketing strategies.